Martin Lundstedt has 27 years of experience in engineering, development, production, and sales in the heavy duty automotive industry. He joined the Volvo Group in October 2015 as president and CEO. Under his leadership, the Volvo Group has grown to a $45 billion company and has made significant advancements in the areas of electromobility, autonomy, and connectivity. 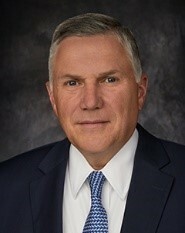 CEO and President, Meritor, Inc.
Jeffrey "Jay" Craig is chief executive officer and president of Meritor, Inc. Previously, he was president and chief operating officer (CEO), with oversight of Meritor's business segments - commercial truck & industrial and aftermarket & trailer. He has been a member of the Meritor Board of Directors since April 2015. Prior to taking on the role of president and COO, Craig was senior vice president and president of Meritor’s commercial truck & industrial segment. He served as senior vice president and chief financial officer at Meritor from 2009 to 2013 and has held various leadership positions at the company since 2006. Before joining Meritor, Craig served as president and CEO of General Motors Acceptance Corp.’s (GMAC) commercial finance organization from 2001 to 2006. Prior to that, Craig was president and CEO of GMAC’s business credit division from 1999 until 2001. He joined GMAC as a general auditor in 1997 from Deloitte & Touche, where he served as an audit partner. Craig holds a Bachelor of Science degree in accounting from Michigan State University and a Master of Business Administration from Duke University in Durham, NC.